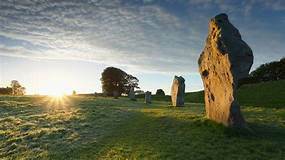 So as discussed in the previous post the British have a problem (illiterate savages that we are -see below-), for not only were all references to the goddess; "Arianrhod ("arian" = silver, "rhod" = wheel, therefore; "Goddess of the Silver Wheel" -the cycles of the moon-), suppressed and wherever manifest destroyed by the Romans (and after its assimilation by their state their religion as-well, although references to her consort, "Kernunnos" or, "Herne" -which is the Saxon version of his name and being also referenced in Saxon culture one of the reasons why familiarity with; "the horned one" persists in these isles-, remained), for it was, "Arianrhod" who in a very real sense defined Brythonic astrology (the, "star of the goddess" being said to be Capella, her constellation now known by its, "Mediterranean" name, "Auriga"), and, "ruled over" (quite literally), Brythonic culture, "we" were also not (as is commonly understood), a literate culture . 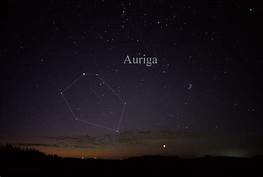 In the Mediterranean/Middle Eastern ephemeredise (astrological systems), Auriga is known as, "The Charioteer" whereas in Brythonic culture Arianrhod is, "the weaver" or, "spider goddess" who spins the web that controls all the cosmic forces affecting man (both within and without), however, in the Norse religion Odin rides on Sleipnir (his eight legged horse -the, "eight legs" also being those of the spider who, "rules" over the eight sabbats, both solar and lunar see prev. post-), having lost an eye to the Norns ("The Fates"), in the Well of Mimmir in order to receive the FUTHARK that is his navigational aid to the; "Nine Realms" (nine; "working moons"? Also see prev. ), which speaks to the later so-called; "Celtic/Norse Fusion" of the Norse-Gaels in Britain. 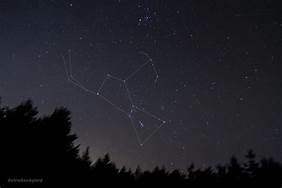 Auriga rises before Orion, "The Hunter" who may represent either, "Ogmios" or Kernunnos himself ("Ogmios" is the, "child of eloquence" whose utterance is the, "sacred sound" of, "Om" or, "The Pranava" that is the, "Logos"), but knowledge of which-is-which and who-is-who is one of the understandings which has, unfortunately, been lost (at least as far as this author is aware), but as Kernnunos is avowedly an, "earth deity" one may speculate that it is the offspring of the goddess not her consort that appears in the stars, however, as the, "reborn child" (who is also, "The Green Man" -whose parallels with Ogmios are obvious because both have, "bindings", which proceed from their mouths, in the case of Ogmios the, "chains of eloquence" which bind man to his will and in the case of the Green Man foliage that also binds man to the will of nature-), does not manifest until after the return of the light and matures during the spring this may be arguable, certainly though, "Arianrhod" is thought to, "correspond with" the Hawthorn tree that is central to the, "May Day" Beltayne celebrations. All of this does, of course, speak to an oral tradition, precisely that tradition that has been lost. What remains of ancient, "Ogham" (the, "manifest utterances of Ogmios"), in stone is fragmentary at best and much if not all of that which would have been carved in wood has simply rotted away. The Egyptian culture was blessed with papyrus and a climate in which writings could be preserved, the Northern European cultures were not so, "fortunate", however, to denigrate Brythonic culture for an apparent lack of literacy is to severely miss the point (and such a mistake also characterises our subsequent post Roman imperial dealings with indigenous cultures all over the world), for there is much that remains in their racial-memory which marks the British out as a singular and (if you'll excuse the tongue-in-cheeky reference), "weird" people. So what to do? We can't, "un-rot" the past (although there may be one or two documents lurking in the Vatican archives which might well be of some use), so how on earth (quite literally), do we go about reconstructing a Brythonic ephemeris? Well there's no substitute for hard work folks and one method that suggests itself immediately is to visit all those, "unfashionable" sacred sites (esp. 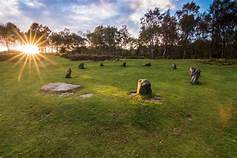 the circles and henges), and make as many observations as possible, this might, however, take a good while for as we know these sites (and as discussed in the previous post sites like them throughout the world), were/are, "predictive texts" and it may, therefore, take many years to unravel their secrets, nevertheless, I see no alternative but to undertake this work as a serious endeavour. We should form a group of enthusiasts who are committed to rediscovering our ancient heritage*. & view the archived responses on, "The Lifeboat News"; also see the work of Graham Phillips, go to: http://www.grahamphillips.net/arthur_tomb/arthur_tomb1.html). Another error made by modern archaeologists is to constantly laud each new discovery concerning the use and, "meaning" of Britain's ancient sites as if each piece of the jig-saw is the last-hurrah regarding such and trumps all the other previously held notions concerning nature and usage, such hubris bespeaks a very blinkered conception; the sites were (and still are in some circles), held to be sacred precisely because they embodied a coming together (literally a, "fusion"), of the forces of creation where, "earth energies" could (with the aid of the enlightened mind), harmonise with the energies of the cosmos to the benefit of all. That such sites should concern themselves with both birth and death is not, therefore, surprising for; "it is by death that life is known", and that such sites should also be places of healing also flows from this notion for it is surely fear of death that most disorders the human spirit. Modern man loves to compartmentalise his existence (which explains the mess we have gotten ourselves into), but to our ancient forebears life and death were all part of the whole and humanity was not separate from its environment, if we are to re-establish this connection in these islands we must commit to a rediscovery of their ancient lore for as discussed in the previous post all our, "groovy" biodynamic permacultures will simply fail to function if we don't understand the mechanics which make these engines of sustainability, "tick".